Unlike Zac and Sarah, Helen is a real person. A Lone Parent working hard and doing the right thing. 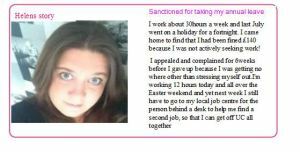 7 Responses to Universal Credit : In work, part time claimants sanctioned for taking holidays and …… for working! Can’t read ‘Helen’s Story’ image?! Sorry John. Reblogged this from another site … will see if I can sort it. Thanks for your concern – I followed your link (“View original”) and viewed the original. Thanks for your blog. (BTW – Use Ctrl + ‘=’ in most browsers to zoom in and Ctrl + ‘-‘ next to it, to zoom out). I can hardly believe this petty restriction of freedom! I’d love to be on Question Time with Dungcan on the panel and ask him if he thought this fair. Doesn’t it breach human rights or something? It’s certainly morally indefensible, but so is the whole premise of the (s)Tory government, that it was the fault of the disabled and unemployed scroungers wot caused the crash in ’08. ‘Even worse – that the gutless British Public swallow it! ‘Just wait till it’s their turn. Imagine how much suffering we could alleviate with that available!